2 Touchless Drive-Thru laser-guided Mark VII AquaJet XT washes. Designed to give you a great wash. We have three packages to choose from ranging from 6$-$10. The Automatics are quick and easy. Major credit cards accepted. 5 Self-Serve High and Low Pressure Bays. Each bay cost $2.50 to start and that will give 5 minutes of wash time. All Bays proudly feature Turtle Wax Professional products. 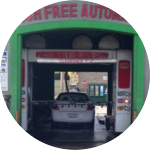 Each bay offers three types of soap solutions, foaming brush, clear coat wax, and spot-free rinse. Major credit cards accepted. 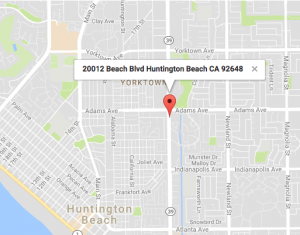 14 Vacuum stations are locates around the perimeter of the wash, so you can take the time to clean your car both inside and out. Vending and Change machines are located in the front and back of the building. 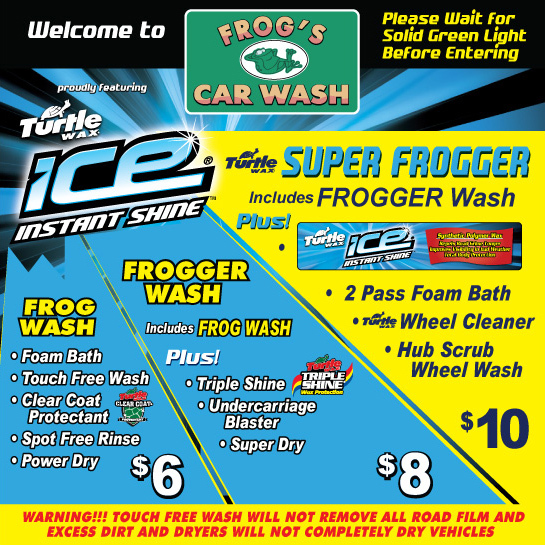 Frog’s Express Wash has a variety of Products and Services to ensure that your car will look it’s absolute best. Our touchless automatics will ensure that even the most fragile classic car will exit without issue. Touchless car washing means that no menacing carpet strips, curtains, dangling cloth, brushes and measuring wands are used or touch your vehicle during the washing process. Rollers don’t drag over your roof or hood, eliminating the possibility of scratches and damage to your cars’ finish. There are no side brushes to bend or damage mirrors. The driers also are not on rollers that climb your car, which could damage your paint or hood ornaments on your car. 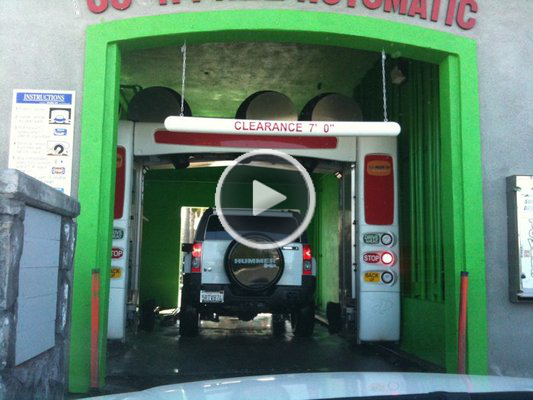 Touchless car washes can be safer for your car than washing your car yourself. Washing your car in direct sunlight can burn spots in the cars paint. Using the wrong types of detergent can remove protective wax and leave chalky residue on the cars’ finish. There are several common mistakes one can make while hand washing their car at home. 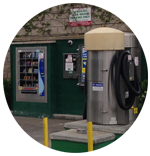 "This place is quick and works really well for a self serve car wash. You can choose between the automatic wash, or the hand spray wash. The machines for the extras like towels, and interior cleaners, etc. 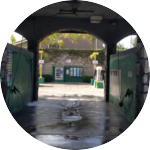 all work, and are always stocked..."
"This is by far the best $10 car wash I have ever gotten. No need to worry about grimy brushes whacking the side of your car and scuffing up your paint. This thing uses high pressure sprayers and does one hell of a job. They even have little spinning brushes that gently clean your wheels..."
"Great place for an auto wash....I've been using Frogs for about 4 years. Normally I go to a regular carwash...but that always takes 30-45 minutes...if you're innna hurry...the $10 deluxe wash has you outta there in about 10 minutes max..."